Hi everyone! I’m still in the South of France on holidays. 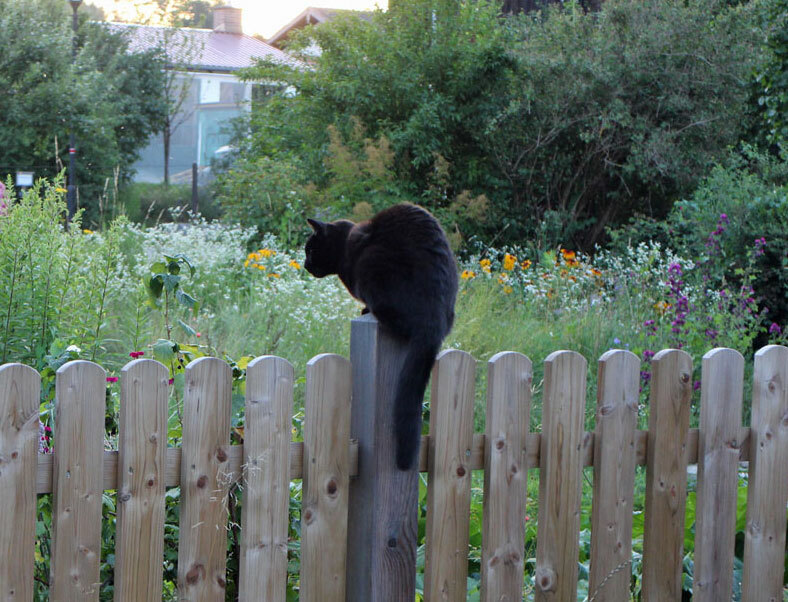 And I noticed that whenever I sit with my laptop on the terrace of our chalet on the camping site I receive curious glances from people walking by. They are probably surprised to see someone working during their summer vacation! 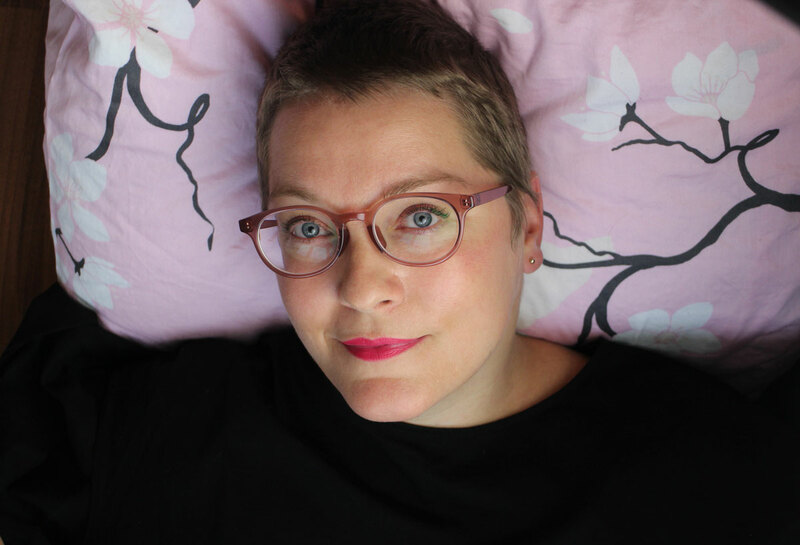 Well, I am self-employed so I don’t really have the luxury of leaving my work for two or three weeks – my blog would be abandoned, my inbox would explode with accumulated mails and my deadlines for other writing projects would simply pass by. For the last seven years of my life, work, holidays and leisure activities have become increasingly interconnected. Whether I like this or not I can’t really say. Sometimes I think it would be a relief to just leave everything in the office for a couple of weeks and simply go on holiday. Then again, I can’t really imagine not thinking about my blog! Am I a workaholic? Or am I just enthusiastic about what I do so I don’t think about work and holiday in terms of the traditional division between “office work” and “annual vacation”? Many people are now adopting a digital nomad lifestyle or opting for a self-employed/temp job situation (of course, very often they don’t have much of a choice!). This also changes when, where and how we work. And I think the whole “work-life balance” issue will continue to shape public discussion about what our workplaces and offices might look like in the future. A week ago I was travelling around the Ardèche. South of the town of Aubenas you can find the small village of Lagorce. This is where organic French beauty brand Melvita has its headquarters. Last year I took part in a guided tour around the Melvita factory, this year I only visited their store. I was particularly interested in the new Argan Concentré Pur range which comprises the gel-textured toner Eau Extraordinaire Argan Jeunesse, a moisturising fluid, an eye cream and the Youthful Cream-Oil. The Cream-Oil is rich and balmy at first but it immediately sinks into the skin and then feels soft and velvety – an interesting texture! Argan oil is listed in third place on the INCI declaration (after water and processed oils); the cream has a slight nutty fragrance. The inside of the cardboard packaging explains how to give yourself a little facial massage whilst applying the cream. I have already seen the Cream-Oil (the name doesn’t really suit the product, I think) in Melvita’s German online shop; it costs 34 Euro. I’ll continue to further test the cream this autumn. It is now cooler than it has been in the previous week and I feel the immediate urge to wear makeup again! And even more so when I discovered the dark red eyeliner #319 Uva from French brand Couleur Caramel’s current limited edition Dolce Vita. I already liked their turquoise eyeliner but the red shade is even more fascinating. It looks surprisingly down to earth when you wear it with black mascara – you really have to look twice to notice the unusual colour. I already bought a back-up because I don’t think I’ll come across such an exotic colour anytime soon. The dark red is also perfect for autumn. The outer packaging of the Sérum Été Estiu from Belesa states „Made in Cévennes“. Unfortunately I did not visit the Cevennes region this time but at least I was in Bagnols-sur-Cèze which has two stores that sell the cosmetics of young French brand Belesa. I had first seen Belesa in the Paris pop-up store of French beauty box supplier Nuoo Box last winter (I had bought Belesa’s chestnut face scrub). The brand has launched several new products since then, like the seasonal serums for spring, summer and autumn (I would imagine that a winter serum is coming soon). My summer serum Estiu is supposed to prepare the skin for sun exposure and prevent it from drying out. The second ingredient in the INCI listing is chestnut extract from the Cevennes (a region which is well-known for its chestnut trees). The chestnut extract is supposed to moisturise and mineralise the skin whilst protecting it from free radicals; the serum also contains karanja oil which might be responsible for the yellow-milky colour of the product. When I applied the serum my skin felt really smooth; the serum is absorbed very quickly. I’ll continue using it throughout the autumn, hydration and antioxidant protection is always helpful 😉 . A beauty brand for Cevennes fans! I really like these kinds of regional brand concepts. 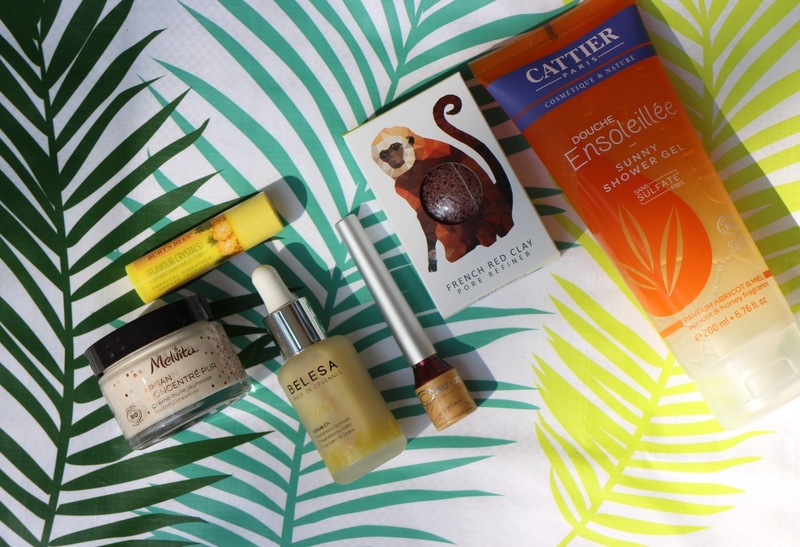 Just before I left for France I bought the Crystal Flavour Pineapple Lip Balm from US brand Burt’s Bees at my local Müller drugstore – I was curious about the product and on that day it was very hot so I was in a tropical summer mood 🙂 . The lip balm stick really does smell like pineapple so the fragrance is quite fruity. The slightly rough texture came as a bit of a surprise at first: the little waxy “crystals” contain the aroma ingredients which melt on the lips when you apply the stick and then release the fragrance. But once the balm is on the lips it feels goods and quite moisturising, too. Like the other lip balm sticks from Burt’s Bees the Pineapple Lip Balm is based on beeswax; it also contains sunflower oil, coconut oil and flavour. The stick is also available with raspberry and orange flavours. Another interesting product from German brand Heliotrop: the company will soon launch a limited edition Oil-in Softening Fluid for Face and Body. US deodorant brand Soapwalla has introduced two new Sensitive Skin Deo Creams that do not contain baking soda: Citrus and Lavender Mint. More info is available here. Swiss brand Farfalla will launch new gift sets with scented sticks and scent bracelets. I wish all of you could have attended New Zealand brand Living Nature’s Master Class back in July (I mentioned the Class in these Beauty Notes here); it was so much fun! The event also gave rise to this Sponsored Post, in which I will show you three different face care routines that showcase almost the entire line-up of Living Nature’s product portfolio. The Master Class had been organised by Birgit Corall and her team – you met Birgit in this interview blog post here; she has been developing Living Nature’s business in Germany for the last twenty years. Birgit also has her own beauty brand, Cobicos, about which I’ve written several times on this blog. 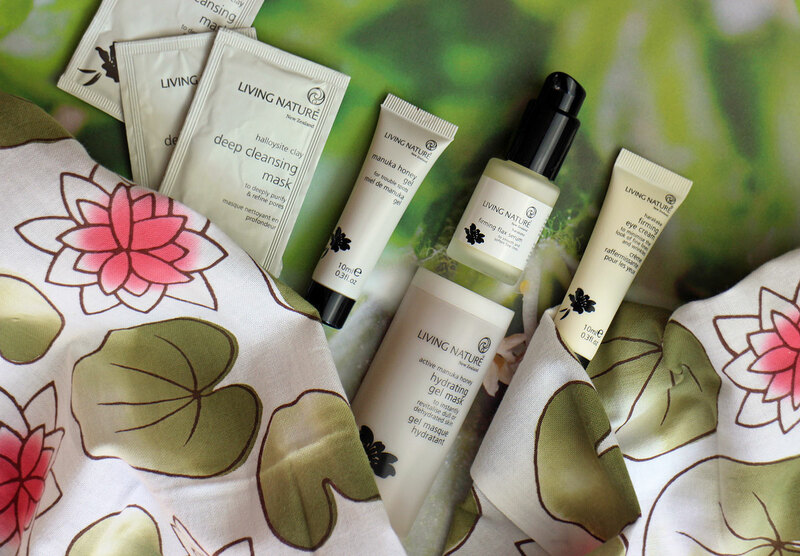 For me, Living Nature is one of the few organic beauty brands that are based on an actual skin care concept. The brand is ideal for anyone with skin problems such as acne, excema or rosacea, or if you have very sensitive skin. Living Nature was launched in 1987 by Suzanne Hall in Kerikeri which is located on the Northern-most tip of New Zealand. The company has a brand store in Kerikeri which I would love to visit one day – unfortunately I have never been to New Zealand. In the Maori language New Zealand means something like “the country of the long white clouds” which I think sounds beautiful. Living Nature’s products are manufactured with local ingredients – in fact, around 80% of the plants that are used in the products only grow in New Zealand. The best-known domestic ingredient is probably manuka honey which the bees collect from the blossoms of the manuka bushes. New Zealand is such a geographically isolated island country that its local flora is unique. You find plants here that do not grow anywhere else in the world. Manuka honey is rich in nutrients, amino acids and minerals. It has strong anti-inflammatory properties which boost the healing processes thanks to active ingredients like methylgloxal (which is why manuka honey is good when you’re suffering from a sore throat). In beauty products manuka honey binds moisture within the skin, regenerates and heals the skin and also has an anti-microbial effect. Manuka oil is distilled from the leaves and twigs of the manuka bush. I would describe manuka essential oil as a milder cousin of the Australian tea tree oil. Manuka oil is even more effective than tea tree as far as its anti-inflammatory, anti-bacterial, fungicidal and antiviral properties are concerned. It’s a good oil to treat acne-prone skin. Harakeke: This is a type of New Zealand grass which contains a polysaccharide gel that resembles aloe vera gel. Harakeke moisturises and cools the skin, offers antioxidant protection and helps to regenerate the skin. 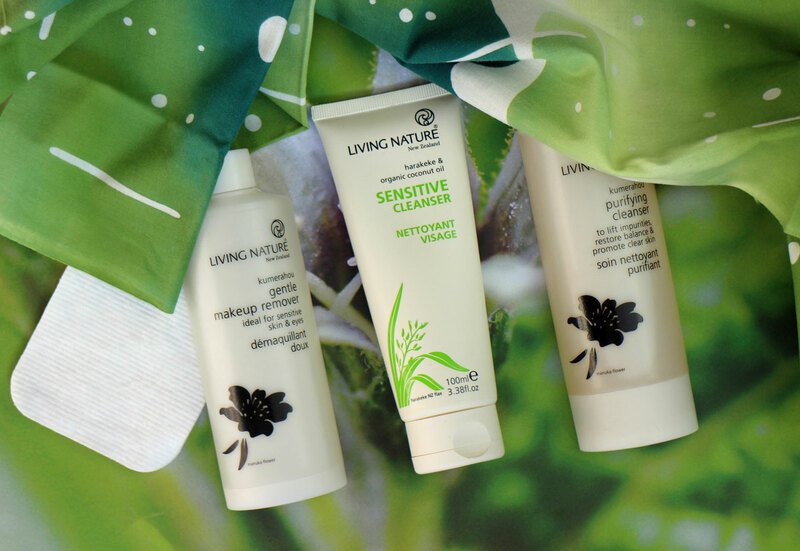 Studies have proven the efficacy of Living Nature’s products and its ingredients. The Abich institute in Italy, for example, has shown that the brand’s Flax Serum (which contains harakeke and manuka) increases hyaluronic acid synthesis in the skin by 86% after just 24 hours. The healing effect of Living Nature’s Balancing Night Gel was demonstrated by the fact that the gel was applied to a cut in the skin. 24 hours later the injury had closed up. Formulations: Most of the brand’s products are based on soft filtered rain water which is collected from the roof tops of the company’s buildings in New Zealand. The products do not contains alcohol (ethanol); the only emulsifiers that are used are cetearyl olivate and sorbitan olivate which are derived from olive oil and have a soothing and anti-inflammatory effect on the skin. Instead of a conventional preservative the brand uses a unique blend of manuka oil, manuka honey, totarol, tea tree oil and lactic acid. The packaging is made from PP and does not contain any softening agents; around 15% of the material is calcium carbonate (chalk). Since the material is only made from one component it is easy to recycle. The decorations on the packs depict plants like harakeke grass or manuka blossom – very pretty! Living Nature’s product portfolio is not structured by skin type. Instead it works as a kind of modular system – you select the products according to your current skin needs. I will show you how the system works (there are five steps) and also give you my recommendations for oily combination skin, dry skin and sensitive skin. As an orientation: my own skin is a dry combination skin – I need a lot more hydration on the cheeks than on the T-zone. I wear makeup almost every day so the first skin care step in the evening is to remove my makeup properly. I use Living Nature’s Gentle Make-up Remover: put some of the remover on a damp cotton wool pad and gently wipe the eye area to remove eye shadow, liner and mascara. Afterwards I wipe the pad across my entire face to remove most of the foundation and powder that I am wearing. I had never tried the makeup remover before so I was pleasantly surprised at the Master Class: the cleanser easily took off my non-waterproof mascara without burning in my eyes, and since the lotion is non-oily it didn’t interfere with the contact lenses I wore that day. The makeup remover does not contain perfume or alcohol; I was particularly intrigued by the ingredient kumerahou, a New Zealand plant which contains natural saponines that boost the cleansing effects of the remover’s sugar tensides. There are three other cleansing products in Living Nature’s portfolio: the Purifying Cleanser is ideal for combination and oily skin. It’s a comparatively liquid gel that is based on sugar and amino acid tensides and foams up quickly. It feels really light on the skin and has a subtle grassy smell. Manuka honey and manuka oil have an anti-bacterial effect without drying out the skin. The Vitalising Cleanser is recommended for normal to dry skin: the milky lotion is almost tenside-free (the sugar tenside listed on the INCI declaration is towards the end of the list; I’d say the milk doesn’t contains more than 1% tenside) so it cleanses particularly gently. My skin actually feels slightly moisturised afterwards. And the Sensitive Cleanser is good for sensitive skin – I already introduced the product on Beautyjagd in this article here. The cleanser is fragrance-free, of course; it contains coconut oil, glycerine and harakeke gel. The texture is light, almost like a cream gel. Living Nature does not offer any spray-on facial toners. Instead there are three Toning Gels (which remind me of Korean gel toners). The Living Nature gels deeply hydrate the skin; for me they are the star products of the brand! After cleansing you apply the gel to the skin and let it sink in for 30 seconds before proceeding to the next skin care step. The Hydrating Toning Gel has been formulated for combination and oily skin; thanks to its cooling effects you can also use it for in-between refreshment if you are suffering from hot flashes. The gel contains less than 5% glycerine (as is the norm for Living Nature’s products) and harakeke gel as well as anti-bacterial manuka oil and manuka honey which help against redness. The gel has a light floral fragrance. The Extra Hydrating Toning Gel for dry skin also contains shea butter and larch tree extract which accounts for the whitish colour of the product. On my skin this gel feel much more moisturising than the „normal“ toning gel; it is almost like a light cream gel. On very hot days I even used it as a day care product. And for sensitive skin there is the Sensitive Hydrating Toner which is fragrance-free, like the entire Sensitive product range. The INCI declaration of this toning gel is short; the product has a lotion-like texture (I have described the gel in more detail here). The toner is based on water, coconut oil and glycerine as well as harakeke. I like to alternate these three toners: if I need coolness and an extra dose of hydration I use the „normal“ toner; the other two gels are more moisturising but still very light and non-sticky. Living Nature calls these products “thirst quenchers” which is a good description – they are ideal for dehydrated skin. If you have oily combination skin you could apply the Balancing Day Cream next. This lotion moisturiser sinks in really quickly and has a light floral fragrance. It contains water and plant-based squalane (which I really like as a skin care ingredient), processed oils, manuka honey and harakeke gel. The actives also include manuka oil and totarol – totarol is derived from New Zealand’s totara tree. Totarol is also a key ingredient in the other two day creams since it has a strong anti-oxidant effect. The Nourishing Day Cream has been formulated for normal to dry skin but it still has a light texture. If you have really dry skin you might prefer the Rich Day Cream which is based on water, avocado oil and macadamia nut oil. These two oils contain a high percentage of oleic acid and are very hydrating. The texture of the Rich Cream is pleasantly non-greasy and absorbs well into the skin. It is also good as a base for makeup. The fragrance is a light blend of floral and woodsy notes. If you have sensitive skin the Sensitive Day Cream is ideal: it contains coconut oil, jojoba esters and avocado oil as well as glycerine and harakeke for an extra boost of hydration. And of course the cream is free from alcohol and fragrance. The texture is nice and balm-like; on the skin it feels more like a gel cream. I’ve become a big fan of the Rich Day Cream because it feels so light on the skin, despite the product name. Some of the combination-skin bloggers at the Master Class really liked the Balancing Cream – for me, however, it wasn’t quite hydrating enough. Unless it is really hot outside. After the Toning Gel comes night care. If you have oily combination skin, the Balancing Night Gel should be a good option. The name indicates what the product feels like: the cream is gel-like and based on water, manuka honey and jojoba oil. Further plant ingredients are manuka oil, harakeke and soothing bisabolol. The Balancing Gel is a light night care product which offers hydration rather than lipids. And it has a cooling effect when you apply it to the skin. 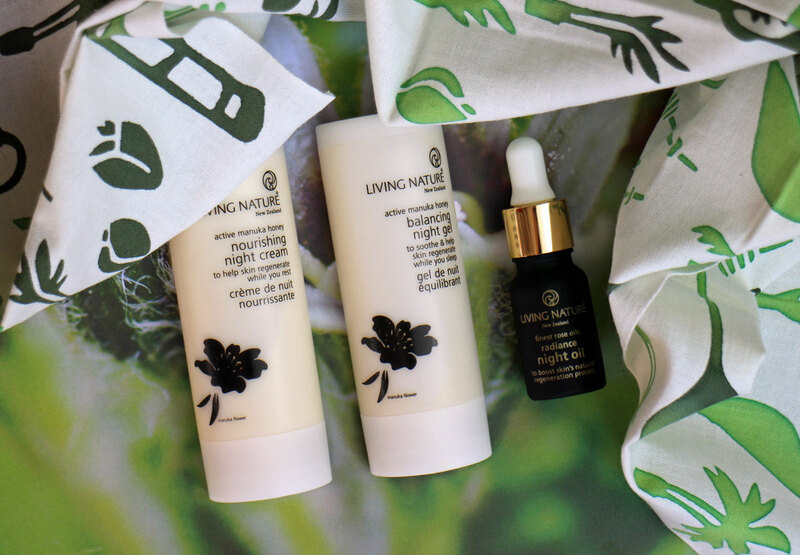 For dry skin, Living Nature’s Nourishing Night Cream is a good choice. The texture is much lighter than the product name sounds like: one of the first ingredients is manuka honey, followed by antioxidant totarol and rosehip kernel oil. The product is scented with subtle floral notes and feels non-greasy on the skin – it would actually be a good base for makeup, I think. If your skin needs an extra moisturising boost, blend the night cream with the Radiance Night Oil – or simply apply the rose-scented oil directly to the skin. I really like the combination of toning gel and face oil. The Radiance Oil is based on rosehip kernel oil, plus soothing calendula, antioxidant carrot oil and essential oils of rose and frankincense – two very skin-friendly oils. And if you have sensitive skin, try out Sensitive Night Cream which contains avocado oil and harakeke gel – it is richer than the day cream. Like all the products in the Sensitive range, the Night Cream is fragrance-free and alcohol-free and the INCI list is nice and short. As you can see the skin care concept of Living Nature is flexible – simply combine the products your skin needs at the moment. However, the product range also offers several special add-on treatments which can intensify and boost the effects of the other products. The brand’s Deep Cleansing Mask is based on ultrafine white Halloysite clay which is only found in New Zealand. The finely milled clay helps to remove dirt from the skin; it’s the ideal face mask for oily or acne-prone skin. The mask is packaged in individual sachets: apply the contents of a sachet to clean skin and leave it on for around 20 minutes. If you like you can gently rub off the mask after ten minutes – then you get a sort of face scrub effect – or do as I do: since the skin on my cheeks is dry I only leave the mask on for five minutes and then rinse it off with lukewarm water. Afterwards my skin looks clear and even-toned. One of Living Nature’s bestsellers is the Manuka Gel (I wrote a blog post about this product back in 2011 – German only, sorry). And I’m not surprised by the popularity of this product: the gel is based on water, manuka honey and manuka oil and the effects are seriously impressive. The Manuka Gel soothes my skin, helps against impurities without drying the skin and it calms my skin down when it is irritated and extra-sensitive. However, you have to be able to tolerate the distinctive herbal smell of manuka and tea tree; not everyone likes that fragrance. I always have a tube of the gel at home. My favourite product at the Master Class was the Firming Flax Serum which packs a serious punch: as the study by Italian institute Abich has proven, the serum boosts collagen and hyaluronic acid production within the skin. A real anti-ageing product! The serum also contains harakeke and manuka honey and is scented with subtle herbal and floral notes. The product is a milky fluid which is packaged in a flacon with pump dispenser; you can apply it in the morning or evening underneath your cream or use it as an eye cream. I usually apply it after the Toning Gel and before my cream. The serum is absorbed quickly into the skin which feels very soft afterwards. The Firming Eye Cream is similar to the Flax Serum but has a more cooling effect when you apply it. The eye cream is fragrance-free, has a light texture and really seems to tighten the skin a bit. 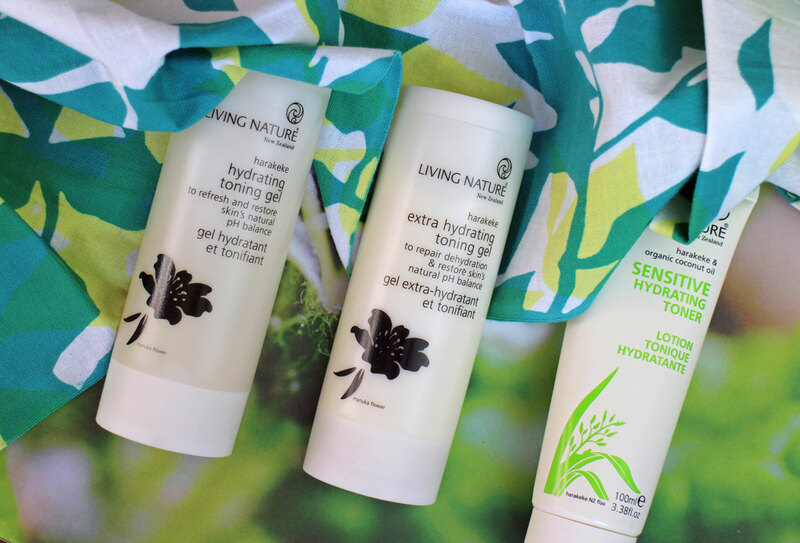 For dehydrated skin Living Nature recommends the Moisturising Gel Mask which I have also used as a soothing after-sun product this summer. Manuka honey is one of the key ingredients in this mask; it has a gel-like texture – apply it to the skin, leave it on for 15 minutes and then rinse it off. If, however, your skin needs lipids rather than moisture try the Ultra Nourishing Mask. I will properly test the product this winter; I think it should also work as a protective day cream if you apply it in a very thin layer. Finally, there is the Sensitive Skin Gel which I described in this blog post here. It is not just suitable for sensitive skin types but also for skin emergencies, or if you suffer from rosacea. For this particular skin problem Living Nature also has some product recommendations – search for the term “rosacea” on the brand’s home page. 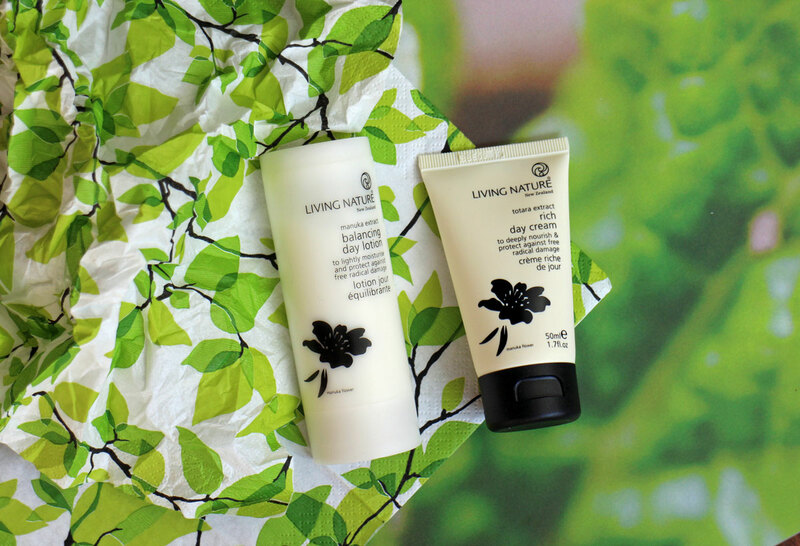 Living Nature products are available online or through organic specialist retailers. The brand website also has a shop finder. I received most of the products for this post from Living Nature; some of the products I already had at home. Hi everyone! I am still in the South of France. This week we’ve had a lot of Mistral winds; in the morning and at night the temperatures are already quite cold – autumn is coming! And I’m returning to Germany soon. As much as I like autumn I am already missing summer 😉 . Last year I came across organic French beauty brand Anne Felker’s store in the little French town of Souspierre – it was an accidental discovery, you can read more about the visit here. I had met Anne Felker at Vivaness trade show and was immediately attracted to the brand’s rose cosmetics. This summer we drove straight to the Anne Felker store and I bought the delicious-looking Granité de Rose. It’s a super gentle facial scrub which looks like a pink-red jam: a combination of rose petals and finely milled raspberry seeds. I tried it out that evening; it’s a beautiful product. Check it out on the brand’s website here. This is a different kind of clay mask! 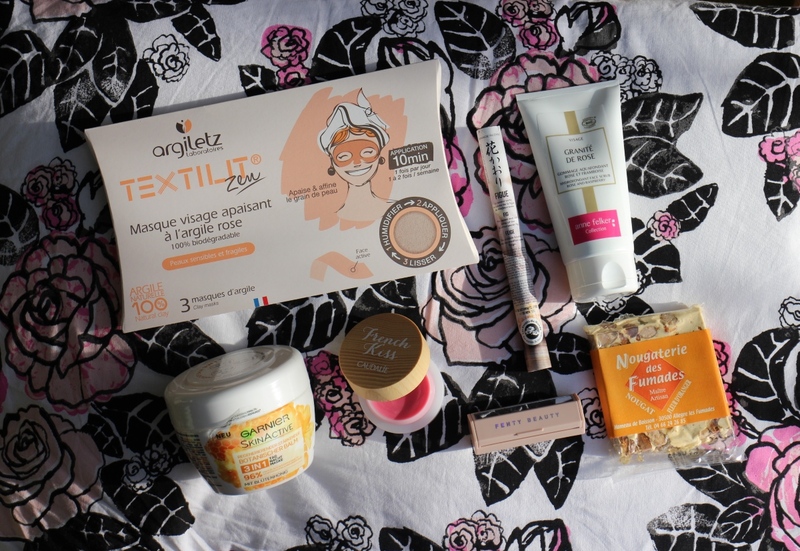 I found the pack with three Textilit Zen Pink Clay Masks from French brand Argiletz in an organic supermarket near our camping site. These are cloth face masks in the shape of the upper half of the face (including the T-zone) which are saturated in medicinal clay. You moisten the mask with a floral hydrosol or water spray and then place it on the face for ten minutes. You can spray on more moisture if you like; in my case the saturated cloth mask held the shape well. Then simply pull off the mask, rinse the last traces of clay off your face and you’re done! A clay mask which doesn’t mess up your wash basin – very convenient! My skin looked refined and calm afterwards which I like. You can buy this brand in many organic supermarkets in France or online. As far as I am aware Argiletz is not available in Germany. In my new blog post for organic online perfumery Najoba (German only, sorry! ), I am showing you which hand-bag sized organic products I always carry around – from a remedy against headache over a small tube of hand cream all the way to my top tip against shiny t-zones. Enjoy! Recently I was asked what I thought about the new face care range that Garnier has just launched here in Germany and other European countries. As a reminder: L’Oréal’s Garnier brand is not usually known for organic cosmetics, Garnier is a conventional beauty brand! However, the INCI list of the Regenerating Botanical Balm 3in1 Day Night Mask looks pretty good and except for one or two ingredients which can’t be certified, the ingredients list could almost be organic (there is, of course, no percentage of organic ingredients listed on the product). What I really like about the product – and the entire range – is the transparency and customer communication: the packaging of the balm explains in plain German exactly what each individual ingredient is. 4% of the ingredients are non-organic and not explained any further; they are simply described as “makes the usage more pleasant and long-lasting”… – The 3in1 balm can be applied as a rich day or night cream or used as a mask if you apply a thick layer to the face (rinse it off after ten minutes). It is a very rich cream with a balmy texture but not greasy. I didn’t like the fragrance which smelled quite synthetic so I only used the balm once. However, what I am impressed by is the transparent ingredients concept – and that is something that organic beauty brands really could take a lesson from! The launch of this product range also shows that conventional cosmetics still continue to move towards a “greener” beauty ideal. … and this development can also be seen in the new French Kiss Lip Balm from Caudalie. Caudalie is a natural (not organic) brand from Bordeaux in France and they have just launched the French Kiss tinted lip balm range. The lip balms are packaged in little jars with bamboo lids and I was intrigued: the INCI declaration didn’t list anything that is not allowed by the European organic certifiers so I bought the pale pink balm Innocence at a local French pharmacy. The texture of the balm is very pleasant, smooth and flexible and neither too oily nor too waxy. For my very demanding lips the balm was not quite moisturising enough to be used as an over-night lip care product. I have seen the French Kiss balms on various blogs so the product must also be available internationally. German brand Sante will launch a new shower balm with fig fragrance soon. More information is available here. US brand Kjaer Weis has introduced new Lip Pencils and Eye Pencils. For more info, click here. German drugstore retailer DM’s organic own label brand Alverde has launched several new products including a gel-to-milk cleanser. Yesterday I saw French brand Couleur Caramel’s new autumn/winter limited edition in an organic store in Avignon. I have posted a pic of the display on Instagram and will write about the collection (which offers liquid eyeliners in new colours, eyeshadows, lipsticks, an eyeshadow base and a highlighting shimmer trio palette for the face) in more detail soon. I finally visited the offices of organic online store Ecco Verde in Austria! I had been planning this for ages and this July it finally happened: I took the eight-hour train journey from Nuremberg across the Alps mountains all the way to scenic Graz in Austria’s Styria region, where Ecco Verde has its headquarters. I already wrote about my visit in these Beauty Notes here but now, in this Sponsored Post, I can finally present you with a more detailed look behind the scenes of Europe’s biggest organic beauty online store. The company’s main office is on Jakominiplatz which is located in the city centre of Graz. Graz is the capital city of Styria and the second-biggest city in Austria. 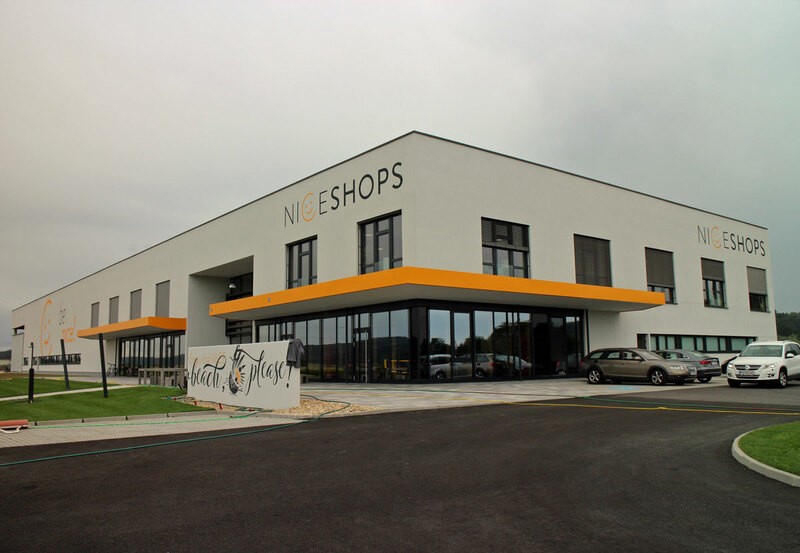 Ecco Verde is the largest store in the Nice Shops group which was founded in 2006 by CEO and owner Roland Fink. 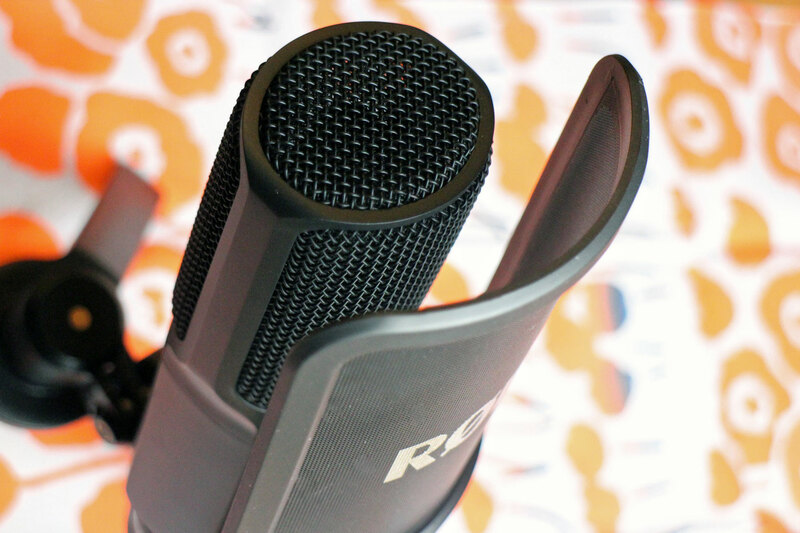 Roland is from the IT industry; he has been developing web shop systems since the early 2000s. In order to demonstrate to his clients what a good web shop could look like, he launched an online store for nutritional supplements, Vitalabo. The initial idea for this shop came from his brother and for the first years, Vitalabo was almost a family project – the “office” was in a garage and cellar in the small town of Bad Gleichenberg (around 60 km to the South-East from Graz) while the product sales and shipping parts of the business were handled by Roland’s mother-in-law and sister-in-law. The software which powered Vitalabo is still in use today. Ecco Verde continuously develops, extends and modifies its technology so the software is always tailored to the current needs of the individual shop system. The Vitalabo launch was followed by further online shops which all focused on a particular niche product category – Biolindo, for example, sells organic and natural household cleansers, Piccantino specialises in fine foods and delicatessen and Geero is an E-Bike retailer. And this is how the Nice Shops group was established. All six partners within the firm have known each other for a long time (some are even related). In 2009 Nice Shops decided to launch a web shop for organic beauty. Alice Falchero (left on the picture) has been with Ecco Verde since the beginning: she is an enthusiastic organic beauty consumer and began to develop the shop’s brand line-up – and very successfully, too; Ecco Verde now is the most important store within the Nice Shops group. Today Alice is responsible for the Italian market and the entire purchasing department of Nice Shops. Two years ago, shop manager Carina Matzhold (right hand side on the photo) joined the Ecco Verde team. 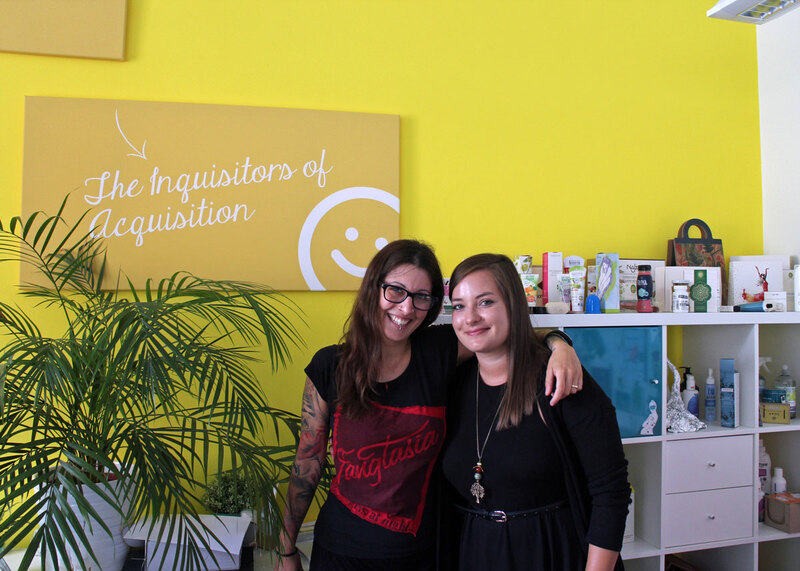 Alice’s and Carina’s desks in the Graz office are located next to each other; on the wall above there’s a big sign which states “The Inquisitors of Acquisition” – a tongue-in-cheek indication that Alice and Carina are the chief buyers for Ecco Verde. The two women also verify whether the beauty products that are sold by Ecco Verde carry an organic certification (for example Natrue, Cosmos, USDA, ICADA or Italian seals ICEA and AIAB) or at least have ingredients that are clean enough that the products could be certified. Alice and Carina also handle the newsletter campaigns and social media activities of the company. Two years ago I interviewed the two of them and Ecco Verde CEO Christoph Schreiner via Skype – you can read the interview (and find out about their favourite beauty products) here. Another key team member in the Graz office is Robert Kniedl (he designs the cooperation banners for my blog) who is the resident specialist for search engine optimisation and e-marketing (Robert is also one of the co-founders of Ecco Verde/Nice Shops). 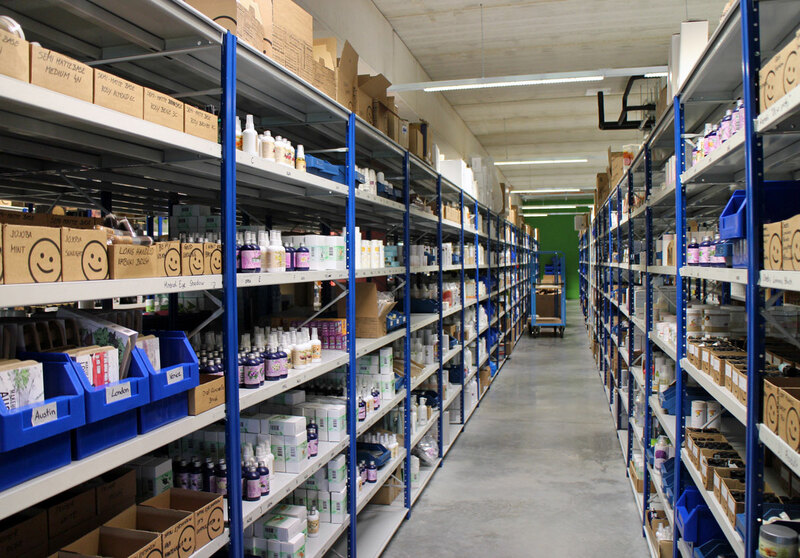 The international shop management and customer service teams are also located in the Graz office – Ecco Verde operates regional sites in 12 European countries/languages. And of course the IT department (without which nothing would work!) is based in Graz. 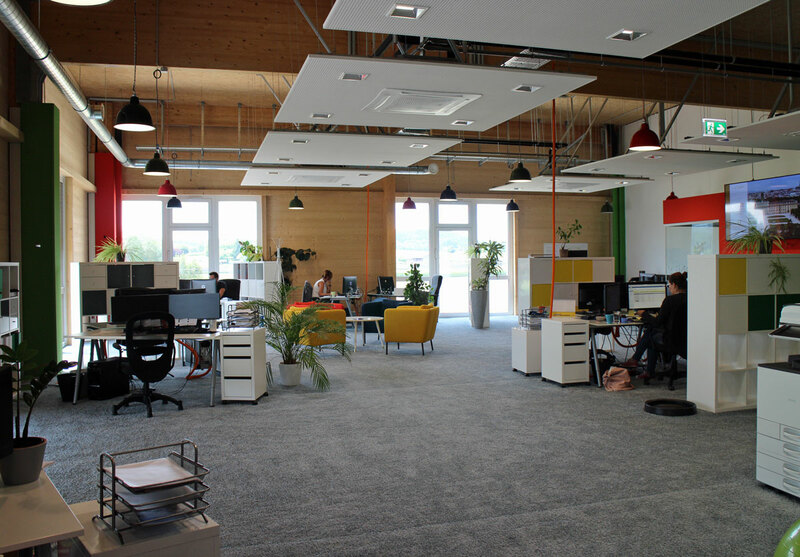 Ecco Verde has two main office locations: the office in Graz city and the logistics centre in the little town of Paldau (around 50 km east from Graz and not too far away from where Roland Fink grew up). This logistics facility was opened very recently (the previous logistics centre in Feldbach had become too small) and is built as environmentally friendly as possible – the building materials include a lot of wooden elements, efficient building insulation conserves energy, heating and cooling is supplied by a dedicated bio gas facility and the cooling units were selected according to their energy consumption. The new logistics complex comprises a 5000 sqm warehouse and a 1000 sqm office which is located directly above the warehouse area. All of Ecco Verde’s employees who prefer to live in the countryside rather than in Graz are based in the Paldau office. The management team is also located here and of course all the team members of the logistics and warehouse departments. On the picture above you can see a beach volleyball field; next year there will also be a new swimming pool for the company’s employees. It’s a really strange contrast: you’re driving through the placid Austrian countryside and suddenly arrive at a super-modern office complex which could also be located on the Google campus in Silicon Valley… The entire office layout and interior design is flowing and spacious; painted in friendly colours. 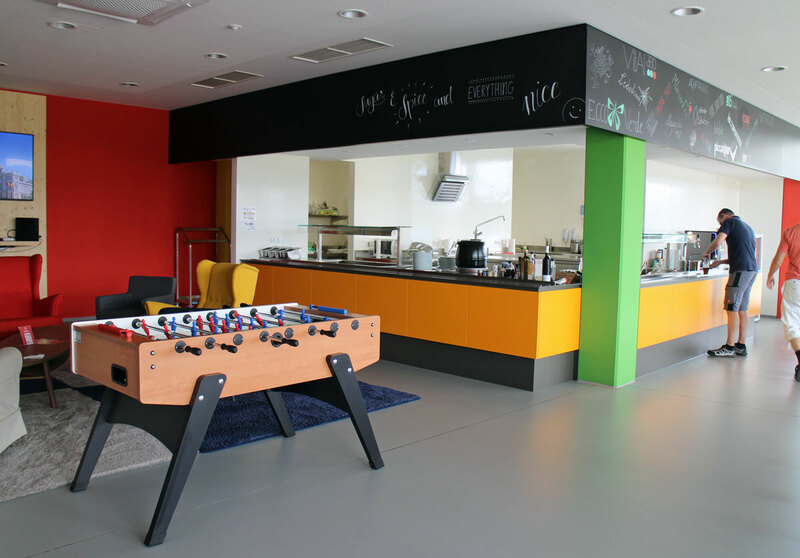 Meeting rooms and conference rooms, the kitchen with a comfortable seating area and the massage room (employees are entitled to massages) are all set in the middle of the open-plan office space. On the picture you can see Lisa who is walking along the shelves with a tablet and an empty wagon: she is collecting the products for ten individual customer orders. 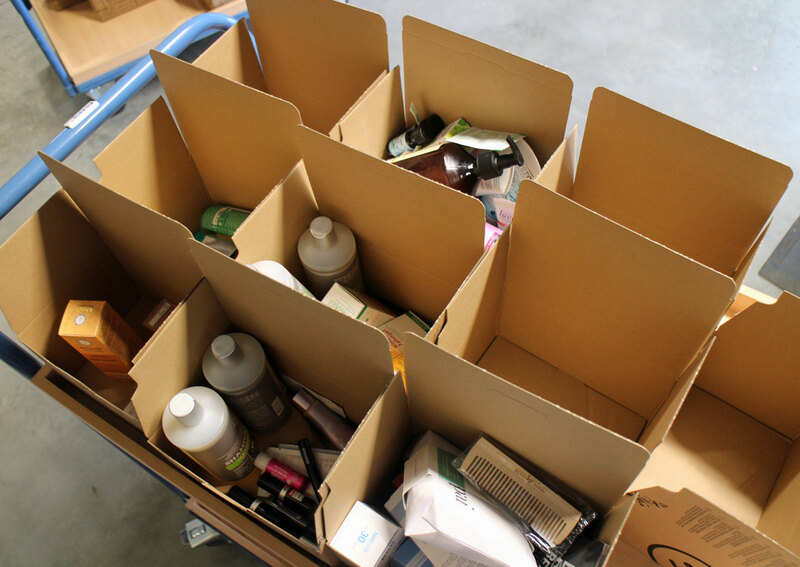 The pickers have to pay close attention to the product lists so they collect and pack the right products – this is especially tricky when an order includes small items, like makeup pencils, liners or lipsticks. On the packaging table the products are then individually wrapped or taped so they will survive the transport without crushing or spilling. You can see on the picture how fast Conny is working! Still, the warehouse pickers are not under time pressure – unlike the warehouse employees of other online retailers like Amazon – but of course working fast really helps when you are dispatching some 4000 parcels per day. As a rule the warehouse employees only work Monday to Friday. The single exception is the Saturday after Black Friday when all other employees pitch in and bake cakes for the diligent warehouse packers. Products are wrapped in paper and cardboard, by the way; the company tries to avoid plastic packaging as much as possible. 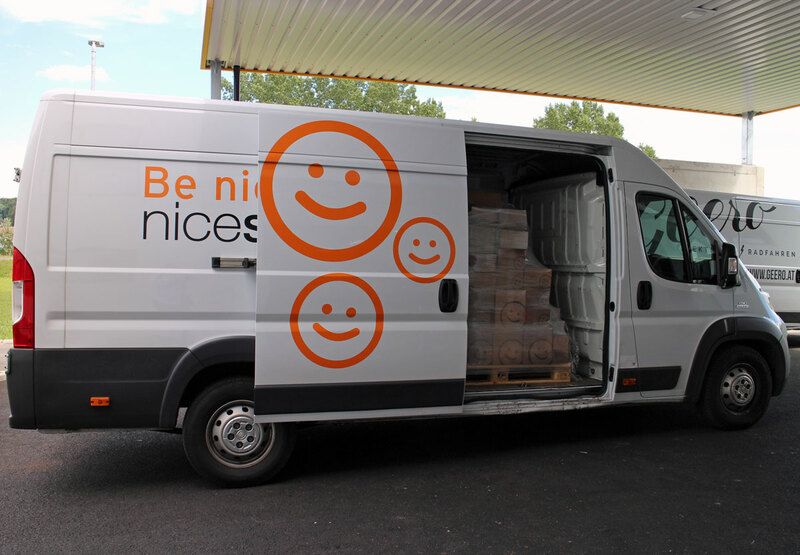 When the parcels are ready they are dispatched to the customers: Ecco Verde vans drive the shipments to the main post office and/or across the border into Germany, Italy or Hungary – these are all countries that share borders with Austria – to ensure next-day delivery. Customer service is very important for Ecco Verde and this includes fast delivery. The company has also just introduced a new feature: customers can now select their free product samples. At lunch time all employees get free food and beverages at the office canteen. Roland Fink told me that he wants his employees to feel happy in the company. This is something that many companies say and it often comes across as an empty statement –in the case of Ecco Verde, however, it feels like a genuine claim. The company’s goal is to match an employee’s specific abilities and talents with available positions within the company. Amongst Ecco Verde’s 140 employees are many team members who have joined the company from other industry sectors. Ecco Verde offers flexible part-time work models and employees with children receive a contribution for child care. International team members can work up to 70 days per year from home so they can spend more time in their home countries. Unsurprisingly, there is not much employee fluctuation at Ecco Verde – people seem to appreciate the friendly and collegial team atmosphere. It should also be mentioned that Ecco Verde (or rather, Nice Shops) is amongst the Top Ten most women-friendly employers in Austria (the company is ranked in 2nd place). Take CEO Barbara Unterkofler, for example, she works part-time for Ecco Verde – in most companies that I know it would be almost impossible for a member of the top management team to work part-time and still retain their position. Ecco Verde, however, manages to do just that. I also asked Roland why he decided on such a rural location for his company. He told me that quite apart from the fact that the Styria region is his home a rural site is actually a distinct advantage for an entrepreneur. These days, commuting long distances from surburban homes to city centre offices is a daily reality for many people. The local municipalities in the Paldau region were glad to welcome a company that would create new (and local) jobs so Roland receives a lot of support with Ecco Verde. There are also fewer formalities and much less bureaucracy. 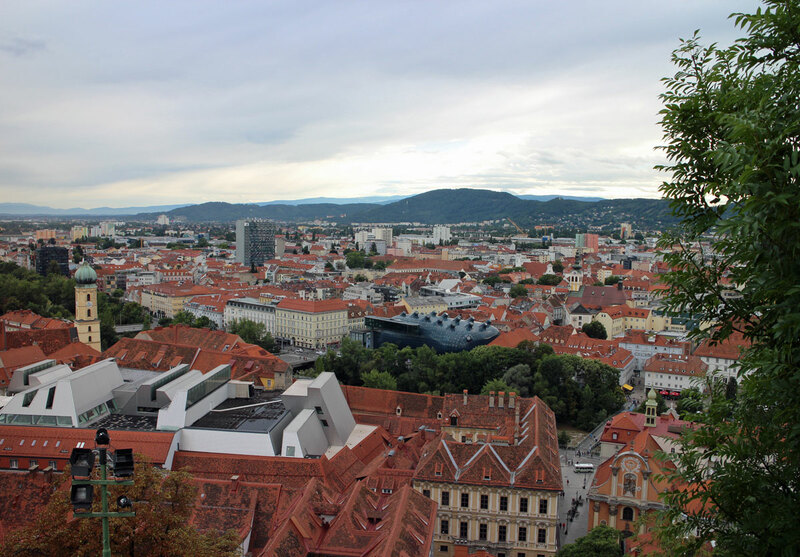 Isn’t this view from the Castle Hill over the city of Graz beautiful? I really enjoyed my day with Ecco Verde – and I continue being impressed by how many innovative companies can be found in Europe’s more rural areas. This trip also made me realise yet again how important human values are in the success of a company. Finally there is some exciting news: Ecco Verde will open a store in Graz this October! Of course the shop won’t sell the company’s entire portfolio of 10.000 beauty items but there should be a good product selection and exciting new brands. The store concept sounds really promising – I guess I’ll simply have to return to Graz to check out the new flagship store 😉 .